Over the last 53, soon 54 years, Mattel's Barbie has done everything from being a doctor, to going to space as an astronaut, however Barbie's accomplishments are only found within the realm of the "fantastic plastic" world. Despite being a fictional "embodiment" of women, Barbie has hit the real world with different forms of media such as magazines, video games, and movies. Now she is moving on—to food. Now that's not to say that Barbie hasn't done food before—if I recall correctly, Mattel released the Barbie Bake with Me Oven back in 2000, and through a partnership with its Chinese partners, they also opened the world's first Barbie flagship store with cafe in Shanghai in 2009. 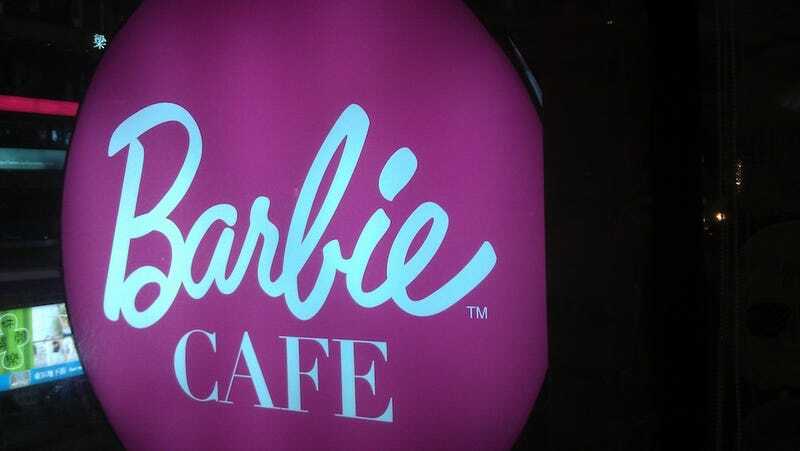 The difference this time around is that, instead of opening a store and providing a glorified waiting area, Mattel has opened a true Barbie Cafe, one where the focus is on the edible side of Barbie. Opened in January, the Barbie Cafe located in Taipei's stylish East district is a pink eyesore to behold. From far far away, one can see the bright neon pink signage that says "Barbie". The second floor restaurant is actually a lot bigger than meets the eye. Walking up the "marbled" steps past silhouetted barbie profiles I was immediately shocked at how ludicrously pink the place was. It was pinker than the Hello Kitty Dreams Cafe in Beijing, and the dim yellow lighting didn't help at all. It almost felt like I was sitting in a real life version of Legally Blonde but with Asians. I am not joking. The flooring material is some light pinkish hue, the ceiling and the wall is another light pink and the pillars are glittering pink rhinestones like someone who loved pink made love to a bedazzled machine and exploded all over the pillars. Unfortunately for me, I had forgotten all about Valentine's Day and attempted to casually visit the cafe. Luckily I had requested the presence of my lovely friend to accompany me on my journey to this pink hole of hell. Because I was such a dolt and forgot what the date was, we didn't have a reservation, so we sat in this makeshift lobby area between the main restaurant and the tea room—a room closed to the general public. In this makeshift lobby they had a couch that was made to look like Barbie's purse. The couch was covered with Barbie-themed throw pillows. Pretty much everything screamed Barbie in the restaurant. The chairs, some were dressed in some kind of weird corset while others were dressed in tutus, all of which were pink. The walls, as pink as they were, were adorned with Barbie posters and pictures. You literally can't go a foot without seeing Barbie's weird un-aging smile. After about 20 minutes of waiting and watching children running around, my friend and I were seated. Our waiter, a young Taiwanese man with a faux hawk dressed in a really really small suit vest and a pink shirt, introduced himself to us and then disappeared while we looked at the decadent menu. The first thing you notice with the menu is that you're instantly looking at Barbie's face, and pretty much every other page is another mug shot of her. For such a big restaurant—it can probably seat at least a hundred—there doesn't seem to be enough waitstaff. It took too long for anything to arrive, but then again I'd have to hand it to the staff. The men all are dressed in black pants, black shoes, a pink shirt and what looks like a really small vest. The women on the other hand were dressed in what looked a pink tutu with a tiara. Unfortunately, it kinda looked like they were dressed like Angelica from Rugrats, a t-shirt over a fluffy dress... needless to say, I was unimpressed. The menu, much like at the Hello Kitty Cafe, was quite extensive, with pages dedicated to lunch sets, afternoon tea, dinner and of course desserts. My companion selected a dinner set of a lotus root appetizer with creamy chicken/mushroom soup to start off with, while I had the scallop (that's right, a single scallop!) and cream of mushroom soup. Interestingly enough, our salad and bread didn't arrive until after the soup was consumed. When the bread did arrive it was a weird but delightful surprise. The bread, a sweet dinner roll with a Barbie branding on one side, was soft and warm. One bite into it, and it released a deliciously warm goo that turned out to be peanut butter! Peanut butter in the dinner roll! While the bread was a nice surprise, the main course was quite a disappointment. I had ordered the pork stew and my companion the seafood risotto. The risotto was overly mushy and bland, whereas the pork stew was way too much work to eat. Pretty much every bite of pork had pieces of bone, and not the good bone that doesn't splinter into the meat that you already have in your mouth. Of course that's not to say the food was bad, it was just bland and not worth the price—something I'll get onto later. The main edible attraction of course was the dessert. Taiwanese media as well as CNN have all wrote about the restaurant's desserts so we ordered a few cakes. I chose the chocolate "tiramisu" cake and my lady friend had the mango sponge cake. The "tiramisu" wasn't exactly tiramisu, instead it was just a tiramisu-colored chocolate cake. In fact it was rather dry. The mango sponge cake was rather respectable, though just a sponge cake with a mango flavored icing. During the meal, I seemed to have bored my companion and she started to play on her phone. So during that time I took a chance to visit the little boys' room and guess who greeted me there? Barbie. Even in the men's room, Barbie was present. It was odd that it was Barbie and not Ken, but I'm not complaining. At the end of the dinner, my companion took a few photos with a Barbie cutout to "memorialize" our time at the Barbie Cafe. The dinner ended up costing about $40! It was a rather "cheap" dinner for two, however, if you take into account local rates and the cost of living, it was quite expensive for such mediocre food—especially since you could take that same amount of money and have a huge feast at one of Taiwan's famous night markets! Had my companion not been with me, I would have been alone, in a pink Barbie Cafe on Valentine's Day, and it would have been awkward. Unfortunately, having her along made it a bit more awkward to explain that we weren't actually on a date. While the novelty of the restaurant is sure to draw guests, the Cafe is only worth a visit if you're a Barbie Fan. If you're not, I'd avoid this restaurant! They don't even have a blonde Russian hottie pretending to be Barbie, like the now closed Shanghai Barbie flagship store. Also, none of the male waitstaff really felt like Ken to me—it might be due to the fact that they're all skinny and slightly shorter than me... I'm a big guy.